This "remodel" was actually a circa 1950’s style ranch house, taken down to the foundation, then added onto to create a spacious modern house, but with a warm, intimate feel. Designed by Studio Ecesis' Michael Cobb, with much design input from the owners, this was a labor of love from the start, as the owners knew this would be their dream house. 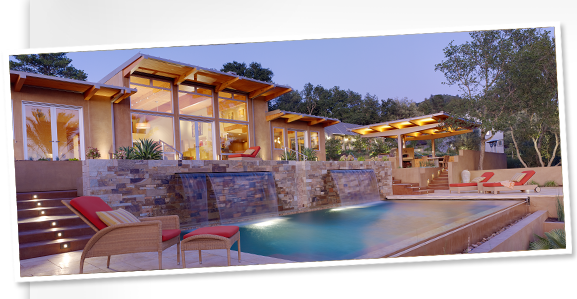 Situated on a large double lot, the project included a complete outdoor environment, with an infinity pool, two cascading waterfalls, a 400+ sq.ft. pool house, outdoor kitchen including a Mugnaini pizza oven and full kitchen ammenities. Also on the property is a 1200 sq.ft. office/art studio building. There are many sophisticated details, too numerous to list here, including a "no trim" interior, level 5 smooth walls, and bamboo floors and cabinets. Outside environment designed by "Exteriors", Santa Rosa. 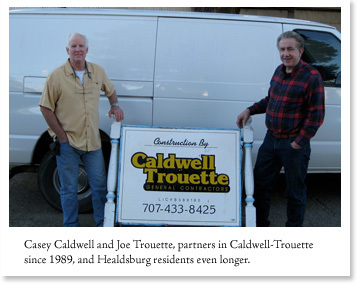 Caldwell-Trouette is a general contracting company located in beautiful Healdsburg, California. We've been in the area since 1981, and are actively involved in the local community. 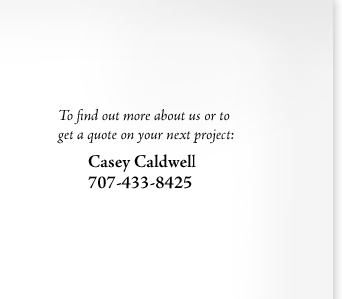 Our services include new construction, renovations, remodels, and additions for both large and small projects and residential and commercial clients. General contractor license #818864.